Tonight I had to do a whole lotta work and wasn't feeling overly fantastic. So I'm just gonna tell the story of THE A-RAB CONFRONTATION before giving a real XXL and luxurious post tomorrow. Now get in the mood, you DiCaprios. 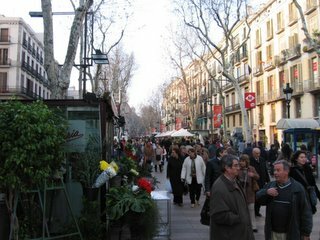 So Tay and I were waltzing down Las Ramblas, the center street in the Old City/Shopping District of Barcelona called by the Lonely Planet companion as "one of the most famous streets in the world." I'm not sure this is true. Is it true? So I was walking with Tay, not this guy. And the moon was out in the final stages of waxing, blurred against a gossamer cloud cover that stayed orange-purple against the city lights. So Tay and I went out searching for food, sangria and general mirth. This is where we were done over by Lonely Planet. Wankers. Don't trust euphemisms in the book, I implore you. 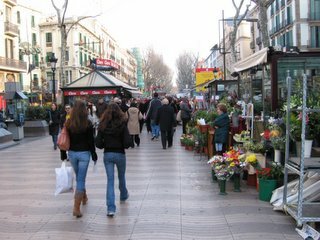 It called El Raval, the area directly west of Las Ramblas, "edgier." Having a long history of adventure and a desire to stay cool, we opted for the edge and hooked a right down a relatively well-lit street. And were approached after about 70 yards by a very thin Arab boy, perhaps 18, with a zestful sense for entrepreneurism and a white track suit. We declined. Tay did in Spanish, saying "no." He continued, following us down the street. A true salesman. Tay spoke in Spanish tongues to tell him to go away, that we did not want any. He did not know Spanish. Only Arabic. So he continued to repeat: "Hashish. Barcelona. Hashish. Barcelona." I threw him against the wall. 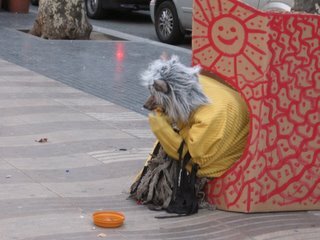 His salesmanship refused, he did not look as if he were pleased with the entire situation. But he sauntered up to me, sizing up his prey, and began his string of errors. (1) You don't wind up to punch on a street. It was like he was loading a musket. We could've found a different restaurant by the time he unloaded. (2) You don't swing your arm laterally to punch. My old football coach used to tell me (through grunts) that HE WAS SO GOOD AT BOXING BECAUSE HE SHOT STRAIGHT FROM THE HIP. The kid swung at me with his right arm, as if he were practicing lob shots at a youth tennis clinic. His forearm (I think it was the forearm?) hit my forearm and dropped. He reached inside his jacket. A bare hand. Nothing in it. (3) You should have something in your pocket. Even one of those monkeys with the cymbals. We laughed (well, I laughed) and started walking away at a pace a little bit quicker than we had been, not wanting to make the situation escalate at all. He trailed us for a bit, until one of his friends stopped him. The faces around us, blurred a bit as we passed them, looked disappointed, as if a ballgame were rained out. There would be no show tonight, friends. Then came the delicious paella and sangria and just another perpetually smiling Spanish waiter. They're such good guys. So that was the pinnacle of the negative aspects of the trip. Tomorrow there will be many pictures (over 120 to choose from...oy) and lots of fun again. Hooray, limited drama!